I read a lot about “drawers full of holsters” accumulated while a shooter tries to find the holster that works for them. I stumbled on a holster and belt combination that worked for me early in my concealed carry experience. 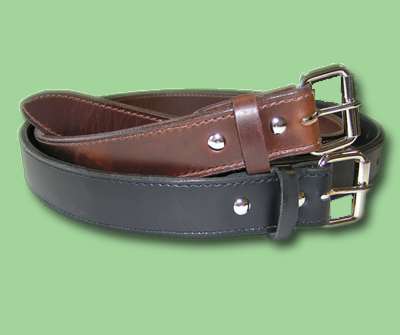 The Crossbreed SuperTuck combined with a Crossbreed leather gun belt. I carry inside the waistband (IWB) at the three o’clock position (my right side). I don’t always carry the same gun, so I have a couple of Crossbreed’s, one that fits my 1911’s and another that fits my Sig P226, Beretta PX-4, S&W M&P, FNX-40, Glock 22 – yep, one holster fits them all. Here’s a picture of my 1911 Crossbreed. It shows some wear and tear because I’ve worn it a lot. 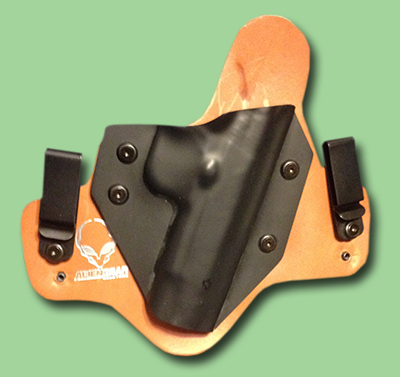 The guns I carry weigh anywhere from 32 to 40 ounces and this holster distributes the weight very well. Combined with the excellent gun belt I obtained from Crossbreed it carries the gun very securely, with no movement. You can only buy these through their website http://www.crossbreedholsters.com. I’ve tried other holsters and until lately, I’ve always come back to the Crossbreed. Recently, however, other companies have started making Crossbreed knockoffs and I decided to try some of them to see how they compare. I’ve been favorably impressed, especially since some of them are priced at about half what a Crossbreed costs. A local company in Arlington, Texas – makes a good Crossbreed knockoff. Their website is http://www.whitehatholsters.com. I find very little difference between the Crossbreed and the White Hat except that White Hat will customize the kydex part of the holster for you. I think they’ll also personalize the leather backing. Personally, I find very little advantage in that because if you’re carrying concealed nobody sees the holster. At least they’re not supposed to. Recently I read some ads by Alien Gear (http://aliengearholsters.com/) and ordered one of their holsters to try. I wore it for several days last week with one of my 1911 Commanders and was impressed. Not only does it cost about half what a Crossbreed or White Hat costs, but for the lifetime of the holster, if you change guns, they’ll provide the kydex for the new gun at no cost. It’s easy to replace as it’s held on by four screws. I’m not sure I’ll ever take them up on that, because for convenience sake I’d want a holster for my old gun and one for my new gun as well. I rarely part with a gun I like. 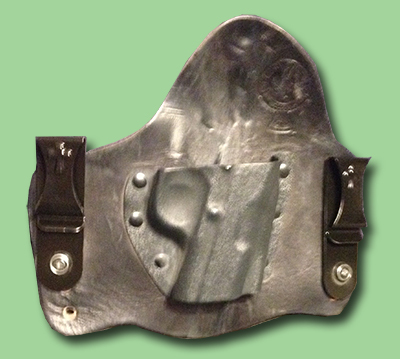 I saw some ads in several of the gun magazines for MTR Custom Leather holsters. I’d tried an all leather holster before – a Wilson Combat Summer Companion. It was very similar to the Milt Sparks Summer Special that a lot of the gun writers like. It’s a very well made holster, but it doesn’t work for me. The gun sits up too high and since the holster uses leather for the belt loops instead of adjustable clips like my other IWB holsters, I can’t find a way to get it far enough down inside my pants to be comfortable and not have the gun grip “kick out” from my body. The MTR Custom Leather Holster does not have this problem. This holster has the adjustable belt clips I like, but the rest of it is pure leather – very good quality leather. The leather even curves around my body, fitting me perfectly. 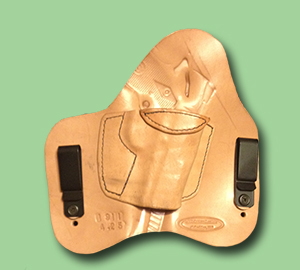 The holster was cured for a 1911 Commander and has slight indents for the grip, safety and slide. It is extremely comfortable! I believe this holster is going to become my new favorite. I’ve only worn it for a little while, but during that short time it’s easy to forget it’s on. I got an IWB magazine holder for two 1911 magazines to go with it. The belt clips aren’t adjustable up and down like the holster, but they seem to be set right where they need to be. The back of the mag holder is smooth leather. I’ve been carrying a single 8-round magazine for my 1911s in a SnagMag, designed to be carried in your pocket, secured with a metal clip like a knife. I’m not particularly enamored with this method of carry. It works, but I find the clip slips a lot and the carrier is down in my pocket and not very comfortable in many seating positions. So I’m hoping this MTR magazine carrier will work for me. All of the holster mentioned above only work with a good gun belt. Let me repeat that all of these holsters, in fact any decent concealed carry holster worn on the belt will only work with a good, sturdy gun belt. People don’t listen to me when I tell them this and they have problems with their holsters, or say they can’t carry a gun. Why this reluctance to buy a good belt, I don’t know, but for some reason people just don’t seem to get this. You need a big gun. Bad guys carry big guns. The odds are against you being able to defend yourself with a little gun. 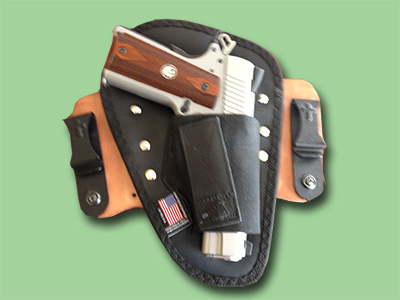 A good holster and a good gun belt will enable you to carry a gun that will do the job. They’ll allow you to carry a gun you can hold onto when you shoot. One you can point or even aim at the threat. One that sends enough lead at enough speed to make a bad person stop doing what they’re doing. Get a good holster and a good gun belt and don’t complain about the price. This is your life we’re talking about, or perhaps the life of one of your loved ones. I liked the padding on the N8 Squared and had a piece of leather from another project so I created a sort of a hybrid. I mounted the N8 to the leather with some brads and wore it for a few days. It worked pretty well and now I can’t find it. I must have showed it to one of my sons or shooting buddies and he wanted to try it and liked it well enough I didn’t get it back. When I ask, nobody seems to know where it is. 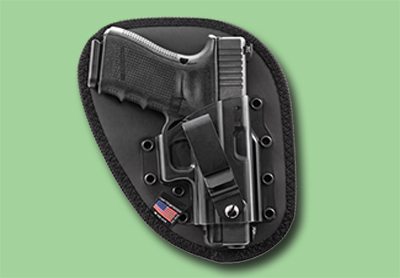 I hope I’ve provided enough information here to help you pick a holster that will work for you. All of the ones I’ve discussed are inside the waistband options (IWB) because that’s what works best for me. They’re all tuckable, meaning you can tuck your shirt in around them if need be. I get to wear my shirt tails out most of the time, so rarely need that option. Oh, and these holsters work for revolvers, too. I bought a White at Holster designed for my Smith & Wesson 686 and guess what. I can carry a Colt 45 Single Action Army in it, too. I have a nice birds head model from Uberti that conceals great in my WhiteHat IWB revolver holster. If you need a good Outside the Waistband holster, I recommend the Gould and Goodrich Model 830, available for most popular handguns. A couple of years ago my instructors began talking with me about supporting local companies and they brought to my attention one company I’ve already mentioned, www.whitehatholsters.com, plus one I haven’t mentioned, D.M. Bullard Leather Company in Azle, TX. A couple of my Crossbreeds were showing wear, so to replace them I got a D.M. Bullard leather holster for my 1911s and another one for the Sig P226, P229, which also works with the M&Ps. I’ve been wearing a D.M. Bullard leather holster daily for probably two years now and can vouch for the comfort and durability of these holsters. We’re now stocking both White Hat and D.M. Bullard holsters in our shop and have arrangements with the companies to get custom ordered holsters at a discount. I have no qualms about recommended either brand, not just because I sell them, but because they work! Previous Previous post: Does the Weight of the Gun Really Matter for Concealed Carry?